At the Paley Institute our approach to treatment of the limb length discrepancy (LLD) and angular deformities of Ollier’s Disease is to surgically correct both simultaneously. In congenital conditions (present at birth) that result in a LLD, we often start lengthening as early as age two, due to the magnitude of the deformity. Since Ollier’s is a progressive deformity (not congenital), the magnitude of the LLD and deformity is quite minor prior to age six. For this reason, we will usually wait to perform surgery until the patient is around six years of age. Most of our patients with Ollier’s Disease will undergo simultaneous femoral and tibial lengthenings. Our results of simultaneous lengthenings are no different than for single bone lengthening. The difference is that we get twice the length in the same amount of treatment time. In the lengthening surgery, an osteotomy (surgical cut) is performed on the bone, separating it into two segments. The segments of bone are then very gradually pulled apart (a process known as distraction). This stimulates new bone to form in the gap, resulting in increased length. The actual lengthening is called the distraction phase. For more information on limb lengthening, see the Center for Limb Lengthening. Intensive, highly specialized physical therapy is required daily throughout the lengthening phase, to ensure a successful result. The fixator lengthens the bone, but physical therapy is required to lengthen the surrounding soft tissues. Without the requisite therapy, many complications can result. In particular, there is a high risk of permanent loss of motion of joints, especially the knee in simultaneous femoral-tibial lengthenings. Skilled, aggressive physical therapy is crucial to avoid developing these complications. At the Paley Institute, we offer an on-site physical therapy department. All of our physical therapists have been specifically trained in treating the lengthening patient. In addition, our physical therapists are in close communication with Dr. Paley throughout the entire lengthening phase. For more information, see Center for Rehabilitation and Physical Therapy. Ollier’s patients typically heal their bones faster than other lengthening patients. This is a great advantage since it reduces the amount of time required to gain a larger amount of length. This can also be a disadvantage, however, as it can result in premature consolidation. If the bone heals too rapidly, faster than the lengthening, the external fixator will no longer be able to pull the ends of the bone apart and lengthening halts. To treat this we have to re-break the bone in a minor outpatient procedure. If rapid bone healing is observed during follow up, Dr. Paley will increase the rate of distraction to avoid premature consolidation. For the first surgery we will use an external fixator to perform the lengthening. 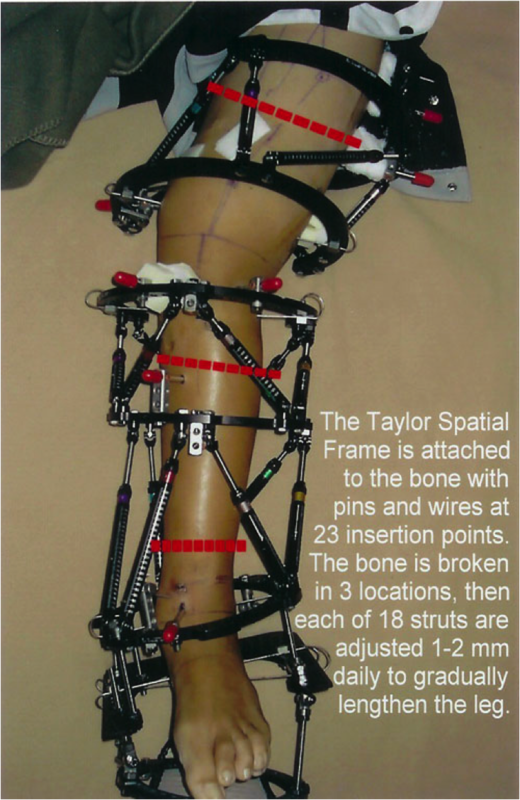 Two types of external fixation are available: circular frames (e.g. 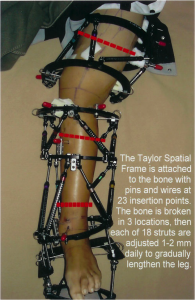 the Ilizarov device and the Taylor spatial frame) and monolateral frames (e.g. the modular rail system). The choice of external fixator depends on the degree of deformity present and the type of bone being lengthened. Circular external fixators can simultaneously correct angular deformities while lengthening; it is preferred in cases where there is significant multi-level deformities. Monolateral fixators cannot perform such rigorous deformity correction, however, they are less bulky and cumbersome and are preferable near joints that move through a large range of motion (e.g. the hip). In general, we will use a circular frame to lengthen and correct the tibia and a monolateral frame to lengthen the femur. Circular external fixators are especially beneficial in lengthening and correcting the tibia since they can lengthen the bone at one level and simultaneously correct bone deformities at multiple levels and in multiple bones at the same time. It permits differential lengthening of the tibia and fibula and allows easy reduction of the lateral subluxation of the talus simultaneous with fixation of the foot. For older patients, we have a new lengthening device that is implanted inside the bone: the PRECICE. The PRECICE was developed by Ellipse Technologies in consultation with multiple orthopedic surgeons, Dr. Paley included. The PRECICE was FDA-approved for use in 2011. The first PRECICE lengthening was performed at the Paley Institute in December, 2011. An upgraded version, the PRECICE 2 was released in 2013. The PRECICE is an internal telescopic rod that is implanted inside the marrow cavity of the bone. The device lengthens similar to the way an antenna extends. An external remote control (ERC) is used to rotate a magnet inside the nail. This in turn rotates gears which turn a drive screw, which extends the telescopic nail. Reversing the direction of rotation causes shortening instead of lengthening, an important safety feature. The PRECICE has many advantages over the external fixator, including no risk of pin infection, no muscle tethering by the pins, less pain, and better comfort. Unfortunately, this method is limited to adults and older children due to implant size limitations. For Ollier’s patients it is usually used for the second and / or third lengthening but rarely for the first. Many patients ask about the enchondromas, specifically if they need to be removed. The answer in our experience is “no.” In all of the cases we have treated to date, we have never removed the enchondroma tissue. In fact, we prefer to make our osteotomy right across these tumors. There is a risk of fracture through the enchondroma tissue during the lengthening. We minimize this risk by performing the osteotomy there in the first place. This is the simplest way of getting the enchondroma to heal and turn into bone. This leads to excellent new bone formation and healing of the enchondroma. We have also treated several patients with untreated Ollier’s who presented as adults. The enchondromas had healed, but the deformities and LLD were still present. They had excellent results in the lengthening and healed very well as adults; they also showed faster bone healing than normal. In adults, we are able to lengthen using the PRECICE intramedullary nail. At the Paley Institute we have extensive experience in limb lengthening and limb deformity correction for Ollier’s Disease. Dr. Paley has performed over 17,000 lengthening surgeries over his career (more than 25 years), making him the most experienced limb lengthening surgeon in the world.